Ebbsfleet is located in the borough of Gravesham in Kent, United Kingdom. Gravesham is bordering Dartford, Medway and neighbouring Essex. The station is named after Ebbsfleet Valley; where the Ebbsfleet River has some historical importance. Ebbsfleet International train station and the M25 are about 4.7 miles apart by car. Ebbsfleet International is only 3 miles away from Gravesend town centre, where you can find shops, cafes, restaurants and bars. Gravesend historical town is popular for promenade walks through the town located at the top of the river Thames. Ebbsfleet also has a football club nearby called Ebbsfleet United, which is more local to Swanscombe. Gravesend train station is just 3 miles away from Ebbsfleet International. The stations are connected by high-speed train taking just 3 minutes, this journey would take 10 minutes by car. Northfleet train station is the one of the closest passenger station to Ebbsfleet at just over 1 miles away taking just under 20 minutes walk time. Swanscombe rail is just over 1 mile from Ebbsfleet station, this journey is one of the quickest taking just 6 minutes by car. Greenhithe is nearly 2 miles away from Ebbsfleet, the journey time is just over 10 minutes by car. 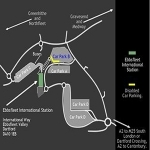 Stone station is just under 4 miles away from Ebbsfleet International, the journey would take just under 15 minutes by car travel. Ebbsfleet Valley began development in 2005 to create housing and business complex 10 times the size of Canary Wharf, equivalent to 552 football pitches. The skeleton of the Straight Tusked Elephant was found on the site that Ebbsfleet International now stands on, the remains date back to around 400,000 years ago. A Roman Villa was found just downstream of Ebbsfleet International. The Anglo-Saxon water mill was discovered by the Ebbsfleet River, it is one of the earliest known mills in the country. A Gallo-Roman broach in the shape of a hare was found on the same site as Ebbsfleet International. The white horse will be a structure created by Mark Wallinger to represent Ebbsfleet ~International in all its Glory, it will be taller than the Angel of the North at double the size and will be seen from over 20 miles away. The sculpture will be placed at Springhead in Northfleet and will be a highlight of the Ebbsfleet Valley area. See Live Train Times from and to Ebbsfleet Station. 1. 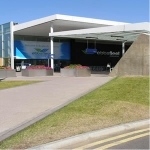 Where is Ebbsfleet International located? (XQE) Ebbsfleet International code for travel connecting via Heathrow Airport, Gatwick Airport, Luton Airport, Stansted Airport and London City Airport. 3. 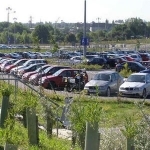 How can I travel to Ebbsfleet International? 4. Is there a place to eat inside the station? Yes, there is a small seated cafe in which you can buy food and drinks, including hot and cold beverages, also hot and chilled foods. Ebbsfleet is a name commonly referred to in England.